This recent parasol was requested via our online store. the moon and the stars, which Thou hast ordained." I was naturally pleased when I received a request for a custom design via the online store. 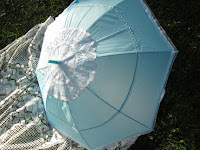 I was also thrilled to be able to price the materials and labor in the same price range as the simpler parasols. The request was for a simple black parasol with either silver or white moon & stars around the edge. You'd be surprised how hard it is to find materials that would lend themselves to this design. I first thought of beads, but I could only find red and blue stars, while moons were non-existent. I opted instead for a liquid silver pen. This pen was wonderful! Not only was it fun to use, but it worked great. The design turned out very clear. The moon & stars pattern was the first challenge, surprising the lace was more of a challenge. Black lace is VERY expensive in our area. The cheapest I could find at first was 4.99 a meter! These parasols take several meters for even a simple design (you wouldn't think so, but the circumference takes a fair bit). I did eventually find affordable lace and this was the result.